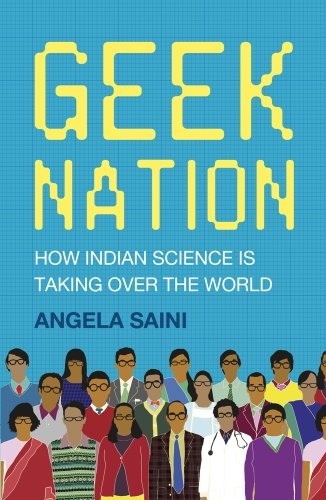 There’s this review of Angela Saini’s Geek Nation, which, in turn, reviews a geek nation – her father’s former workplace, India. Geek Nation loosely falls into the same genre as Robert Kaplan’s works – being based on a journey through a nation, with interviews, destinations and an intellectual focus on one aspect of the country, but without Kaplan’s harsh subject matter. Thus, I am taking nothing away from Saini’s work when I say it has a lighter spirit than Kaplan’s renown efforts, in both style and content. Robert Kaplan looked at political unease and turmoil – some in fairly harsh situations. Angela Saini has happier aspirations, targeting development of technological culture and business. Geek Nation a blend of intelligent travelogue and extended investigative journalism, not a history text, an economics analysis, or a philosophical treatise. If you’re thinking of a heavy tome that you struggle past dense prose, profuse reference citations and opaque footnotes, forget it. This isn’t that book. Geek Nation is an easy and fun read. Her journey makes it’s way over many parts of India, interviewing a wide range of people, looking at the growth of science and technology there. This might seem a dry theme, but if you recall Bill Bryson’s A Short History of Nearly Everything you’ll know it doesn’t have to be, and it isn’t. Who might it appeal to? Those who’ve travelled to India, or who’d like to armchair travel there, will find another side to India that you won’t see in a typical descriptive guide or traveller’s account – a view of a nation through it’s geeky aspirations. Scientists, engineers and those in other technological fields or businesses may enjoy exploring the issues and promises of developing technology in India or similar countries. I think they’ll better appreciate this if they have some hands-on experience of India, or Asia in general, but you’d still get something from it without that. Indians, expat and local will of course naturally look to it. I understand it’s on the Indian best-seller lists. On a more personal note, like many New Zealanders I’ve spend time there – over six months wandering through Western India from southern India up to Uttar Pradesh, the province immediately west of Nepal, both areas she visits and then on into Pakistan. It was interesting for me to see an inside view of the research institutes she visits and to visualise how India has progressed. Geek Nation opens with a Preface, followed by an Introduction. The Preface draws a parallel between the Bakhshali manuscript, am ancient mathematical text found near the village of Bakhshali, and the potential for a return to a strong scientific culture in modern-day India. The Introduction recounts a visit to the Vikram Sarabhai Space Center and conversations with Professor Rao. In hindsight my reading of these first two sections of the book may have been influenced by the subtitle. ‘How Indian Science is taking over the world’ is, to my mind, too readily misread as meaning the book offers a (possibly uncritical) explanation rather than asking the question, exploring it as it does. Don’t be fooled. The body of the text is critical and investigative as you might want it to be. From there Geek Nation makes it’s way past Tata Consultancy Services (which she criticises but also points to an interesting parallel with Japan’s development as a high-tech nation), engineers, computer programmers, biotechnology, religion, neuroscience, nuclear power and other topics in her wide cast of players. As you’d expect of a book looking at India, it touches on it’s share of what will be new insights and curiosities to Western readers. The rat race of students trying to climb the heap, but not necessarily developing good critical or analytical skills. Matrimonial advertisements. Interesting statistics (tempting as it is, I’m not offering spoilers here). The problem of illiteracy in bringing technology to India. I was surprised to learn of the extent of the GMO ‘wars’ there – a bit depressing, but it was interesting to learn the peculiarly Indian aspects of these. Geek Nation even mentions forensic science, the topic of my previous book review, which apparently includes an Indian speciality – tracing cow killings. I can recommend Geek Nation to anyone interested in a more the skin-deep appreciation of Asian nations or to the development of science and technology outside of Western Nations. As an entertaining read, there’s no need to feel that you need a scholarly or business justification to enjoy Geek Nation. The book includes an Index (6 pages) and References (11 pages). A large number of the references are available on-line. These could keep those seeking further reading busy for some time, at no additional cost. 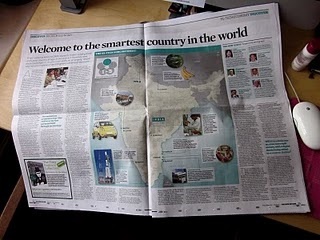 Title: Geek Nation: how Indian science is taking over the world. Cost (New Zealand): RRP $NZ39.99, trade paperback. Availability: All major on-line sellers and, for New Zealanders – the better bookshops (I suggest the University Book Shops in particular are likely to have it stocked, as they generally have a better range of titles). Angela Saini is a former BBC science journalist (appearing both on radio [BBC World Service] and television) and her work has appeared in Science, The Guardian, NewScientist and Wired. More recently, she has chosen to leave to take up a freelance career to better align her work with modern multi-media. She was the winner of the European Junior Science Writer of the Year, 2009 (Euroscience Foundation) and was shortlisted for the 2010 Association of British Science Writers Award. On-line she blogs at Nothing shocks me, I’m a scientist and can be found on twitter @AngelaDSaini. I love Bryson’s accounts of meeting people–Bill Bryson doing what he does so well–but a few of the science descriptions irritated me (in particular his account of protein folding sticks in memory as irritating me). India is cricket-mad. For those outside the UK and the former British colonies, a googly has nothing to do with google, but is a type of delivery made by a spin bowler. Hmm. Even that sentence needs explaining, eh? Cricket is full of terms. A batsman receives a ball bowled from a bowler (balls are not thrown – that’s against the rules). The ball bowled is often referred to as a delivery. Balls are usually bowled to bounce on the ground somewhere in front of, or slightly to one side of, the batsman. (Balls that don’t are referred to as ‘full tosses’.) Spin bowlers bowl relatively slow deliveries, but the ball is deceptively spun so that on bouncing on the ground in front of the batsman it deviates from a linear path, making them tricky to hit. I can remember children in India approaching me, seeing the New Zealand flag, and saying ’Martin Crowe, Martin Crowe’. Having said that, in my personal experience football (the round ball) is easily the more universally known sport. Say the word ‘football’ in any country and eyes light up. One quibble from a computational biologist here. Saini writes that we (humans) have approximately 23,000 genes. She’s pretty much right, but the fussy might point out that many estimates are closer to 22,000. (Or even offer other values.) But this is a quibble, right? I can remember them being great reads – some were remarkably frank (for a Westerner, that is). I’m reminded of the work local biotechnology research institute, AgResearch, on done meat tracing and New Zealand’s recent efforts to secure a free trade agreement with India. My review copy was courtesy of Hatchette, New Zealand. Science, bloggers, activists, and science as ’the one true global culture’?